Public-domain software is software that has been placed in the public domain: in other words, there is absolutely no ownership such as copyright, trademark, or patent. Software in the public domain can be modified, distributed, or sold even without any attribution by anyone; this is unlike the common case of software under exclusive copyright, where software licenses grant limited usage rights. Under the Berne Convention, which most countries have signed, an author automatically obtains the exclusive copyright to anything they have written, and local law may similarly grant copyright, patent, or trademark rights by default. The Berne Convention also covers programs. Therefore, a program is automatically subject to a copyright, and if it is to be placed in the public domain, the author must explicitly disclaim the copyright and other rights on it in some way, e.g. by a waiver statement. In some Jurisdictions, some rights (in particular moral rights) cannot be disclaimed: for instance, civil law tradition-based German law's "Urheberrecht" differs here from the Anglo-Saxon common law tradition's "copyright" concept. In the 1950s to the 1990s software culture, as original academic phenomena, "public-domain" (usually abbreviated to "PD") software was popular. This kind of freely distributed and shared "free software" combined the nowadays differentiated software classes of freeware, shareware and free and open-source software and was created in academia, and by hobbyists and hackers. As software was often written in an interpreted language such as BASIC, the source code was needed and therefore distributed to run the software. PD software was also shared and distributed as printed source code (type-in program) in computer magazines (like Creative Computing, SoftSide, Compute!, Byte etc.) and books, like the bestseller BASIC Computer Games. Early on, closed-source software was uncommon until the mid-1970s to the 1980s. Before 1974, when the US Commission on New Technological Uses of Copyrighted Works (CONTU) decided that "computer programs, to the extent that they embody an author's original creation, are proper subject matter of copyright", software was not copyrightable and therefore always in public domain. This legislation, plus court decisions such as Apple v. Franklin in 1983 for object code, clarified that the Copyright Act gave computer programs the copyright status of literary works. In the 1980s, a common way to share public-domain software[verification needed] was by receiving them through a local user group or a company like PC-SIG, of Sunnyvale, California, who maintained a mail-order catalog of more than 300 disks with an average price of US$6. Public-domain software with source code was also shared on BBS networks. Public-domain software was commercialized sometimes by a donationware model, asking the users for a money donation to be sent by mail. The public-domain "free sharing" and "donationware" commercialization models evolved in following years to the (non-voluntary) shareware model, and software free of charge, called freeware. Additionally, due to other changes in the computer industry, the sharing of source code became less usual. With the Berne Convention Implementation Act of 1988 (and the earlier Copyright Act of 1976), the legal base for public-domain software changed drastically. Before the act, releasing a software without copyright notice was enough for dedicating to public domain. With the new copyright act, software was by default copyright-protected and needed an explicit waiver statement or license of the author. Reference implementations of algorithms, often cryptographic algorithms, meant or applied for standardization are still often given into the public domain, examples are CERN httpd in 1993 and Serpent cipher in 1999. The Openwall Project maintains a list of several algorithms and their source code in the public domain. As response in the end 1980s of the academic software ecosystem to the change in the copyright system, permissive license texts were developed, like the BSD license and derivatives. Permissive-licensed software, which is a kind of free and open-source software, shares most characteristics of the earlier public-domain software, but stands on the legal base of copyright law. In 1980s Richard Stallman, who worked long in an academic environment of "public-domain"-like software sharing, noticed the emerge of proprietary software and the decline of the public-domain software ecosystem. As approach to preserve this ecosystem he created a software license, the GPL, which encodes the "public-domain" rights and enforces them irrevocable on software. Paradoxically, his copyleft approach relies on the enforceability of the copyright to be effective. Copyleft free software shares therefore many properties with public-domain software, but doesn't allow relicensing or sublicensing. Unlike real public-domain software or permissive-licensed software, Stallman's copyleft license tries to enforce the free shareability of software also for the future by not allowing license changes. To refer to free software (which is under a free software license) or to software distributed and usable free of charge (freeware) as "public-domain" is therefore incorrect. While public domain gives up the author's exclusive rights (e.g. copyright), in free software the author's copyright is still retained and used, for instance to enforce copyleft or to hand out permissive-licensed software. Licensed software is in general not in the public domain. Another distinct difference is that an executable program may be in the public domain even if its source code is not made available (making the program not feasibly modifiable), while free software has the source code always available. With the 2000s and the emerge of peer-to-peer sharing networks and sharing in web development, a new copyright-critical developer generation made the "license-free" public-domain software model visible again, also criticizing the FOSS license ecosystem ("Post Open Source") as stabilizing part of the copyright system. New non-FOSS licenses and waiver texts were developed, notable the Creative Commons "CC0" (2009) and the "Unlicense" (2010), and a growing popularity of permissive software licenses was noticed. Also, the growing problem of orphaned software and digital obsolescence of software raised the awareness of the relevance of passing software into public domain again for a better digital preservation of the digital heritage, unrestricted by copyright and DRM. Around 2004 there was a debate whether public-domain software can be considered part of the FOSS ecosystem, as lawyer Lawrence Rosen argued in the essay "Why the public domain isn't a license" that software could not truly be given into public domain, a position that faced opposition by Daniel J. Bernstein and others. In 2012, the status was finally resolved when Rosen changed his mind and accepted the CC0 as open-source license, while admitting that contrary to previous claims copyright can be waived away, backed by a Ninth circuit's decision. Before the Berne Convention Implementation Act of 1988 (and the earlier Copyright Act of 1976, which went into effect in 1978) works could be easily given into the public domain by just releasing it without an explicit copyright notice and no Copyright registration. After the 1988 implementation act, all works were by default copyright-protected and needed to be actively given into public domain by a waiver statement. Copyrighted works, like software, are meant to pass into public domain after the copyright term, losing their copyright privilege. Due to the decades-long copyright protection granted by the Berne Convention, no software has ever passed into public domain by leaving copyright terms. The question how fast works should pass into public domain has been a matter of scientific and public debates, also for software like video games. While real public domain makes software licenses unnecessary, as no owner/author is required to grant permission ("Permission culture"), there are licenses that grant public-domain-like rights. There is no universally agreed-upon license, but multiple licenses that aim to release source code into the public domain. In 2000 the WTFPL was released as public-domain-like license/waiver/anti-copyright notice. 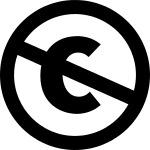 In 2009 the Creative commons released the CC0, which was created for compatibility with also law domains (e.g. Civil law of continental Europe) where dedicating into public domain is problematic. This is achieved by a public-domain waiver statement and a fall-back all-permissive license, for the case the waiver is not possible. The Unlicense, published around 2010, has a focus on an anti-copyright message. The unlicense offers a public-domain waiver text with a fall-back public-domain-like license inspired by permissive licenses but without attribution clause. In 2015 Github reported that of their approx. 5.1 million licensed projects hosted almost 2% use the unlicense, approx. 102,000 projects. In result, such licensed Public-domain software has all four freedoms but is not hampered by the complexities of attribution (restriction of permissive licensed software) or license compatibility (issue with copyleft licensed software). Public domain software in the early computer age was for instance shared as type-in program in computer magazines and books like BASIC Computer Games. Explicit PD waiver statements or license files were at that time unusual. Publicly available software without a copyright notice was assumed to be, and shared as, public-domain software. Many PD software authors kept the practices of public-domain release without having a waiver text, not knowing or caring for the changed copyright law and creating therefore a legal problem. On the other hand, magazines started in the mid-1980s to claim copyright even for type-in programs that were seen as PD before. Only slowly PD software authors started to include explicit relinquishment or license statement texts. These examples of modern PD software (after the Berne Convention Implementation Act of 1988) is either under proper public domain (e.g. created by a US governmental organization), under a proper public-domain-like license (for instance CC0) or accompanied by a clear waiver statement from the author. While not as widespread as in the pre-2000s, PD software still exists nowadays. For example, SourceForge listed 334 hosted PD projects in 2016, GitHub 102,000 PD projects under the unlicense alone in 2015. In 2016 an analysis of the Fedora Project's packages revealed "public domain" as seventh most popular "license". The award-winning video game developer Jason Rohrer releases his works into the PD, as do several cryptographers, such as Daniel J. Bernstein, Bruce Schneier and Douglas Crockford, with reference implementations of cryptographic algorithms. ^ Open Source: Technology and Policy by Fadi P. Deek, James A. M. McHugh "Public domain", page 227 (2008). ^ Shea, Tom (1983-06-23). "Free software - Free software is a junkyard of software spare parts". InfoWorld. Retrieved 2016-02-10. In contrast to commercial software is a large and growing body of free software that exists in the public domain. Public-domain software is written by microcomputer hobbyists (also known as "hackers") many of whom are professional programmers in their work life. ^ April 1987: Ballerburg - Zwei Spieler, zwei Burgen und ein Berg dazwischen... on eckhardkruse.net: "Ich habe das Programm als Public Domain veröffentlicht (die Unterscheidung in Freeware, Shareware usw. gab es damals nicht), mit der Bitte um eine 20 DM Spende. Dafür gab es dann die erweitere Version und den Quellcode." (in German). ^ "Bob Wallace Timeline". Erowid. Jan 12, 2004. Retrieved March 7, 2013. ^ Article about Jim "Button" Knopf, from Dr. Dobb's Journal. ^ a b Copyright Notice, U.S. Copyright Office Circular 3, 2008. ^ The birth of the web Licensing the web on cern.ch (2014). ^ Source code snippets and frameworks placed in the public domain on openwall.info. ^ Shankland, Stephen (February 28, 2008). "Is public domain software open-source?". cnet.com. Retrieved 2016-02-03. There's no doubt that open-source software and that in the public domain are similar. But even experts differ about just how closely linked they are. ^ The Surprising History of Copyright and The Promise of a Post-Copyright World by Karl Fogel (2006). ^ Younger developers reject licensing, risk chance for reform on opensource.com by Luis Villa (on 12 Feb 2013). ^ Pushing back against licensing and the permission culture Luis Villa (January 28, 2013). ^ Post open source software, licensing and GitHub on opensource.com by Richard Fontana (on 13 Aug 2013). ^ Charlesworth, Andrew (5 November 2002). "The CAMiLEON Project: Legal issues arising from the work aiming to preserve elements of the interactive multimedia work entitled "The BBC Domesday Project"". Kingston upon Hull: Information Law and Technology Unit, University of Hull. Archived from the original (Microsoft Word) on 6 February 2011. Retrieved 23 March 2011. ^ a b Walker, John (2014-01-29). "GOG's Time Machine Sale Lets You CONTROL TIME ITSELF". Rock, Paper, Shotgun. Retrieved 2016-01-30. As someone who desperately pines for the PD model that drove creativity before the copyright industry malevolently took over the planet, it saddens my heart that a game two decades old isn’t released into the world. ^ a b Walker, John (2014-02-03). "Editorial: Why Games Should Enter The Public Domain". Rock, Paper, Shotgun. Retrieved 2016-01-30. games more than a couple of decades old aren’t entering the public domain. Twenty years was a fairly arbitrary number, one that seems to make sense in the context of games’ lives, but it could be twenty-five, thirty. ^ a b Rouner, Jef (April 28, 2015). "U.S. Copyright Office to Explore Making Some Video Games Public Domain". Houston Press. Retrieved 2016-02-03. ^ Placing documents into the public domain by Daniel J. Bernstein on cr.yp.to: "Most rights can be voluntarily abandoned ('waived') by the owner of the rights. Legislators can go to extra effort to create rights that can't be abandoned, but usually they don't do this. In particular, you can voluntarily abandon your United States copyrights: 'It is well settled that rights gained under the Copyright Act may be abandoned. But abandonment of a right must be manifested by some overt act indicating an intention to abandon that right. See Hampton v. Paramount Pictures Corp., 279 F.2d 100, 104 (9th Cir. 1960).' " (2004). ^ Lawrence Rosen (2012-03-08). "(License-review) (License-discuss) CC0 incompliant with OSD on patents, (was: MXM compared to CC0)". opensource.org. Archived from the original on 2016-03-12. Retrieved 2016-02-22. The case you referenced in your email, Hampton v. Paramount Pictures, 279 F.2d 100 (9th Cir. Cal. 1960), stands for the proposition that, at least in the Ninth Circuit, a person can indeed abandon his copyrights (counter to what I wrote in my article) – but it takes the equivalent of a manifest license to do so. :-) [...] For the record, I have already voted +1 to approve the CC0 public domain dedication and fallback license as OSD compliant. I admit that I have argued for years against the "public domain" as an open source license, but in retrospect, considering the minimal risk to developers and users relying on such software and the evident popularity of that "license", I changed my mind. One can't stand in the way of a fire hose of free public domain software, even if it doesn't come with a better FOSS license that I trust more. ^ Watt, Richard (September 26, 2014). Handbook on the Economics of Copyright: A Guide for Students and Teachers. Edward Elgar Publishing. Retrieved 2015-01-11. ^ Pollock, Rufus (2007-10-01). "OPTIMAL COPYRIGHT OVER TIME: TECHNOLOGICAL CHANGE AND THE STOCK OF WORKS" (PDF). University of Cambridge. Archived from the original (PDF) on 2013-02-21. Retrieved 2015-01-11. ^ Pollock, Rufus (2009-06-15). "FOREVER MINUS A DAY? CALCULATING OPTIMAL COPYRIGHT TERM" (PDF). University of Cambridge. Archived from the original (PDF) on 2013-01-12. Retrieved 2015-01-11. The optimal term of copyright has been a matter for extensive debate over the last decade. ^ "Downloads". Creative Commons. 2015-12-16. Retrieved 2015-12-24. ^ Version 1.0 license on anonscm.debian.org. ^ "Alan Turing at 100". Harvard Gazette. Retrieved 2016-02-22. ^ history-of-spice on allaboutcircuits.com "The origin of SPICE traces back to another circuit simulation program called CANCER. Developed by professor Ronald Rohrer of U.C. Berkeley along with some of his students in the late 1960s, CANCER continued to be improved through the early 1970s. When Rohrer left Berkeley, CANCER was re-written and re-named to SPICE, released as version 1 to the public domain in May of 1972. Version 2 of SPICE was released in 1975 (version 2g6—the version used in this book—is a minor revision of this 1975 release). Instrumental in the decision to release SPICE as a public-domain computer program was professor Donald Pederson of Berkeley, who believed that all significant technical progress happens when information is freely shared. I for one thank him for his vision." ^ Classic Games on oilzine.com "Space War (Asteroids) - Steve Russell – MIT - Tech Model Railroad Club (TMRC) - PDP-1 In 1961, the game that would eventually become Asteroids started life, humbly, at MIT (Massachusetts Institute of Technology). [...] It was also open source, so the code was public domain, available for anybody to utilize and improve upon." ^ Transactor_v8i3.pdf: "though our disk labels show a copyright notice, up until this issue we stated right on our policies page (page 2) that our programs are 'public domain; free to copy, not to sell'. This notice goes back about 4 years – a popular phrase originally designed to prevent one's program from being 'acquired' by someone in the software business". ^ Anwesha Das (22 June 2016). "Software Licenses in Fedora Ecosystem". anweshadas.in. Retrieved 2016-06-27. In the above bar-chart I have counted GPL and its different versions as one family, and I did the same with LGPL too. From this diagram it is very much clear that the MIT License is the most used license, with a total number of use case of 2706. Therefore comes GPL (i.e GNU General Public License) and its different versions, BSD, LGPL (i.e. GNU Lesser General Public License) and its different versions, ASL (i.e Apache Software License) family, MPL (i.e. Mozilla Public License). Apart from these licenses there are projects who has submitted themselves into Public Domain and that number is 137. ^ "youtube-dl GitHub page". GitHub. Retrieved 2 October 2016. ^ Igor Pavlov (2008). "LZMA SDK (Software Development Kit)". Retrieved 2013-06-16. ^ tinyspeck (2013-11-18). "Glitch is Dead, Long Live Glitch! - Art & Code from the Game Released into Public Domain". glitchthegame.com. Retrieved 2013-12-11. The entire library of art assets from the game, has been made freely available, dedicated to the public domain. Code from the game client is included to help developers work with the assets. All of it can be downloaded and used by anyone, for any purpose. ^ Blackwell, Laura (2013-11-18). "Afterlife of an MMO: Glitch's offbeat art enters public domain". pcworld.com. Retrieved 2013-12-11. ^ KeccakReferenceAndOptimized-3.2.zip in mainReference.c: "The Keccak sponge function, designed by Guido Bertoni, Joan Daemen, Michaël Peeters and Gilles Van Assche. For more information, feedback or questions, please refer to our website: http://keccak.noekeon.org/Implementation[permanent dead link] by the designers, hereby denoted as 'the implementer'. To the extent possible under law, the implementer has waived all copyright and related or neighboring rights to the source code in this file. https://creativecommons.org/publicdomain/zero/1.0/". "Public domain software". Categories of free and nonfree software. Free Software Foundation. Retrieved 2013-07-31. "Cod5.org: public domain software source code archive". Cod5. Archived from the original on 2015-03-19. Retrieved 2015-03-12. "Unlicensed Free Software". Unlicense. Retrieved 2015-03-12.